We are proud to be working with NOW Live Events at Deptford Lounge, London as part of the London-wide ‘Anxiety Arts Festival’ over June 2014. Our workshop is 4pm-4:45pm on Tuesday 24th June. Sarah is also making soft sculture bunting to decorate the venue with words on wellbeing. They will be up to see for the entire festival. We will be part of this jam-packed programme championing an innovative blend of arts and wellbeing activities for all ages to stimulate the senses, lighten the mind and savour the moment with some of UK’s most inspiring artists and thinkers, locally and beyond. THere will be literature, performance, craft, poetry, visual arts, spoken word, music, mindfulness meditation, workshops for children and more. The programme includes Britain’s leading lifestyle philosopher Roman Krznaric, spoken word artist Simon Mole and Chill Pill Collective, mindfulness expert Tessa Watt and us, Craftivist Collective. All events will be FREE, apart from ticketed evening events on Monday, Thursday and Friday. We often reflect on the time to come or time gone by without really enjoying where we are now. We are connected to others and we have an impact as a local and global citizen (for most of us quite a daunting thought). 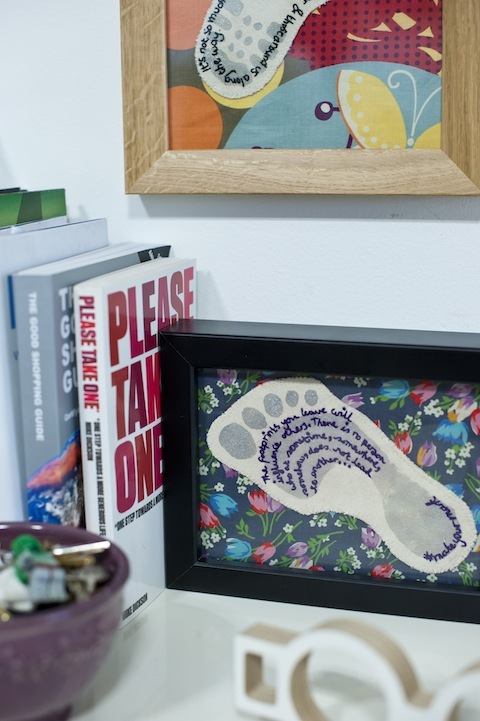 It is easy to let life pass us by so why not craft yourself a physical footprint to help you focus yourself on the NOW and remember how to be your best self in your local community using your unique passions, talents & actions? In this workshop led by our Founder of Craftivist Collective Sarah Corbett, you will learn the classic skill of embroidery whilst also learning how to be a change-maker to make the world a better place for people and planet. You will create a fabric footprint for you to keep and you will receive support on what message to stitch on your footprint and suggestions of where to put it. I’m looking forward to creating a space and environment for participants to feel safe and open to how my approach to craftivism can benefit them personally, collectively and politically. Politics is personal and so is the solution. I hope people leave feeling they know more about the different benefits Craftivism can offer and how they can use it in their life and work & become craftivists!